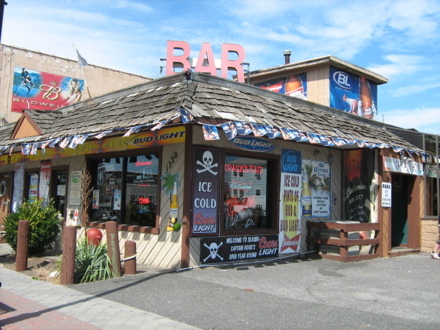 Critical Analyses: Has Captain Hook’s Pirate Bar Been Compromised? During the summer of 2009 I was in the midst of an existential disintegration. A barrage of white people problems had left me stupefied, destabilized, bereft of the prior joys I had, as far back as memory served, been accustomed to. Whirlpools of oblivion were exploding to sudden life across the seas of my being. I was watching The Rules of Attraction roughly thirty times a week. Music once loved played in stifled mono. I reread favorite passages from favorite books and found the impact deadened. Words that before had pierced and altered hit like the mittened hands of children, innocuous, padded and un-bruising. It was a time of thorough self-consumption, and it was then that Captain Hook’s Pirate Bar established itself as my world’s sole sanctuary. Around Hook’s elaborate pirate ship bar I found a second home. Friendships were strengthened. Gimlets were downed. A hundred hallowed instances cast themselves in the kiln of my memory and a hundred more were cast and cooled and forgotten. I reveled in the diversions Hook’s afforded me. I don’t possess the recall to recall every ping pong triumph, every Hunter Hero, every shuffleboard re-sanding. What I can recollect are the sentiments that preside, to this day, of feeling much better when I had never before felt worse. Hook’s was where I perfected Jukebox Hegemony, where I mastered nightlife photography, where I discovered The Surfer on Acid, where, during a gentlemanly game of billiards, I dubbed Chris McGowan The Professor for the first time. Hook’s is the seat of innumerable, impossibly cherished moments in the fractured continumum of my existence. This will not, cannot change. Simultaneously, change is this universe’s only constant, and, in keeping with that precept, the Hook’s that provided me so much has been, every so slightly, transformed. We idealize what we care about. We see perfection where perfection is not, cast flaws as endearments and assets as minor miracles. Unconsciously, unfortunately, this establishes a revulsion towards any and all change in regards to the adored. To change is to become unlike that which we like so much. What we fail to see is that concurrently we too are changing, and that the change we view in the viewed is in actuality the change in our perception of the debatably changed and whether change is entirely an objective or subjective or an amalgam of objectivity and subjectivity I don’t know. What I do know is that on Thursday night Hook’s had Shot Girls, and that is something I will never un-know. Much of Hook’s charm resided in its decrepitude. The floorboards were splintery and treacherous, the couches sweater-itchy and ominously stained. When it rained, the roof leaked profusely. When it snowed, the roof leaked profusely. When outside temperatures rose above 90 F, the air-conditioners would over-exert themselves and the roof would leak profusely. The establishment’s supposed pirate theme is merely nominal, as the decorations are mostly nonsensical workings of neon and and busted pianos and suits of armor. Atop the building, instead of displaying the expected HOOK’S in midget-sized electric lettering, it simply read BAR. These were the failings that made Hook’s great, perfect in every corner of my heart, and each and every one of these imperfections has been fastidiously remedied. The floors have been completely redone. Gone are the clawing couches of old. In their place rest plush, domineering leather divans. The teetering, imperfectly arranged tables and stools have been replaced by meticulously set-up, brand-new amenities, sponsored by Red Bull. Thursdays now feature live, deplorable, smash-your-soul-to-soul-smithereens music that assault the ears to their most basic workings. Conversations are drowned out completely. One must pay for ping pong. The jukebox ignores-regardless of your selecting the PLAY SONG NEXT OPTION-your opting to have “No Hands” by Waka Flocka play nine times in a row. Like an obvious, blinding metaphor, the outside sign that once read BAR reads HOOK’S, and, ironically, it’s as though Hook’s is the last place that place is. Myself offered up no answers. In a confused rage, I stumbled out into the summer night, drunk, and, as life is prone to do, my answer was waiting for me there in the form of Hook’s Asian bouncer (in Hook’s Argot: Captain Hook). Against the bike rack he leaned, smoking the last of his cigarette to the quick. He recognized me, nodded. Stunned, I stared back and summoned up the courage to ask him the question that would determine the trajectory for the rest of my life. “Is it true there was a cover here the other night?” I asked, knowing that a yes would send me reeling into the void, back to the confusion and internal anguish I thought I had finally escaped. The ship is irrefutably sinking, but the sinking ship is my ship. I intend to go down with my ship, whether I recognize it or not. Riggers plays Seinfeld and Iron Maiden concurrently. Steffy, see you at Riggers.